Tue, Jul 19, 2016, 07:49 pm SL Time, ColomboPage News Desk, Sri Lanka. 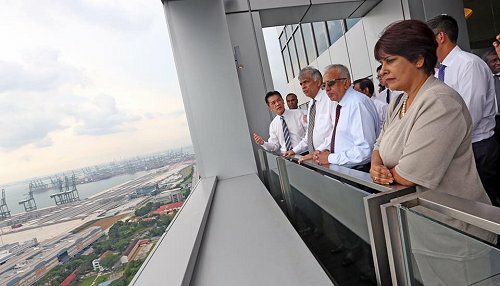 July 19, Singapore: Sri Lanka's Prime Minister Ranil Wickremesinghe, who is on a three-day official visit to Singapore, has extended an invitation to Singapore's Business Community to invest in the island nation as the government has embarked on an ambitious economic development program. 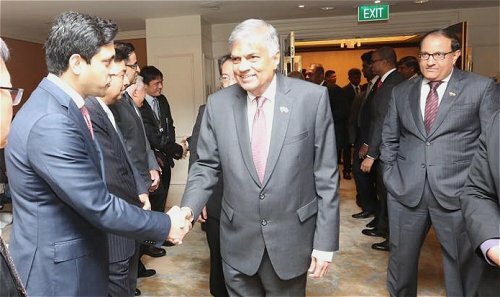 Prime Minister Wickremesinghe met with the Singapore's Business Community on Tuesday and participated in a business dialogue with a group of Singapore companies, chaired by Singapore Minister for Trade and Industry S Iswaran. The Premier discussed the future economic opportunities and the shape of the Sri Lankan economy. He explained to the business leaders about the huge Indian market towards which Sri Lanka's economic program is aimed and according to the Premier, the concept is appealing to them. "I made an open invitation for them to invest in the Sri Lankan economy, which they responded positively towards," the Premier said. The Sri Lankan Prime Minister, who arrived on Sunday, received a ceremonial welcome at the Istana on Monday. He called on the President Tony Tan Keng Yam and met Prime Minister Lee Hsien Loong. Prime Minister Lee also hosted an official lunch in honor of Prime Minister Wickremesinghe. During their meetings, the leaders reaffirmed the warm and growing ties between the two countries. 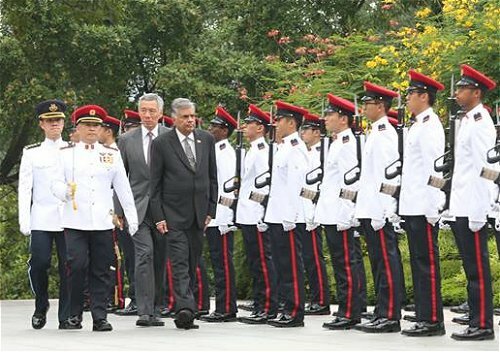 President Tan and Prime Minister Wickremesinghe highlighted the longstanding friendship between Singapore and Sri Lanka, undergirded by strong people-to-people links. They also discussed global political and economic challenges. In their meeting, Prime Minister Lee and Prime Minister Wickremesinghe exchanged views on deepening cooperation in a number of areas, including tourism, business promotion and capacity building. They also discussed Prime Minister Wickremesinghe's economic vision for Sri Lanka, as well as recent developments in South Asia. The two Prime Ministers witnessed the signing of four Memoranda of Understanding (MOUs), and a Joint Statement between the Ministry of Trade and Industry of Singapore and the Ministry of Development Strategies and International Trade of Sri Lanka to launch negotiations on a bilateral free trade agreement. The MOUs covered culture cooperation, capacity-building for government officials, technical and vocational education and training, and urban solutions. In addition, the National Library Board will donate another 500 books to update the Jaffna Public Library's (JPL's) collection, as part of its longstanding collaboration with the JPL. In addition, Prime Minister Wickremesinghe delivered the Special Address at the Third South Asia Diaspora Convention on Monday, and visited Singapore Port Authority to better understand Singapore�s port management. Mr. Wickremesinghe met with the head of the Singapore Port Authority, South Asian Regional Association CEO Mr. Ong Kim Pong and received assurances for assistance to develop Sri Lanka's ports. Mr. Pong pointing out that they had already observed the modernization of the East Container Terminal at the Colombo Port said he was willing and ready to provide technical assistance in the modification and development of the Sri Lanka Port. The top officials of the Singapore Port Authority extended their belief that Sri Lanka could not only become a maritime hub in South Asia, but also take full advantage of implementing China's "one belt, one road" system. 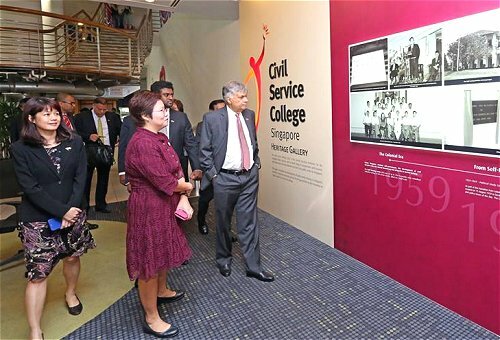 The PM on Tuesday also visited the Singapore Civil Service College, where he was briefed on capacity-building and training programs, and engaged in a special discussion with the College officials on the necessity of uplifting administrative services. During the discussion, special attention was paid to promoting and expanding the ongoing training programs carried out between Sri Lanka Institute of Development Administration (SLIDA) and the Civil Service College of Singapore, as well as strengthening ties between the Sri Lanka Judges Institute and the Civil Service College. He also toured the National Gallery Singapore and Singapore River waterfront to learn about Singapore's conservation and urban rejuvenation efforts. Prime Minister Wickremesinghe is expected to depart Singapore for Sri Lanka Tuesday night.